FHP INDUCTION MOTOR CONTROLLER USING ANTIPARALLEL THYRISTOR. -Front panel built with high class insulated Printed Circuit Board sheet with well printed circuits and symbols. -Patch Cords 2mm and 4mm Both. -The trainer is housed in Metal cabinet. Size of the trainer set 15"x11"
Speed Control of FHP Induction Motor Using Antiparallel SCR and AC Phase Control Method. Isolated Supply 0-220V AT 2A. 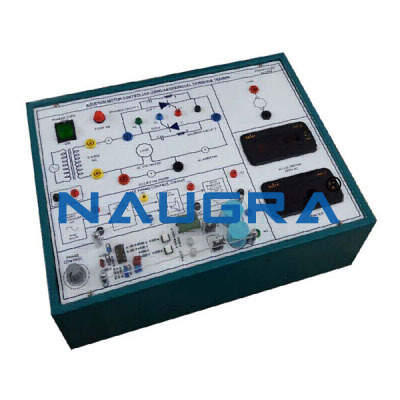 AC Phase Control by Gate Control Firing Circuit. We are leading manufacturers, suppliers & exporters of FHP INDUCTION MOTOR CONTROLLER USING ANTIPARALLEL THYRISTOR. Contact us to get high quality designed FHP INDUCTION MOTOR CONTROLLER USING ANTIPARALLEL THYRISTOR for schools, colleges, universities, research labs, laboratories and various industries. We accept bulk orders for government tenders in all countries around the globe. For similar products visit at main page of Electrical Drive Lab.